Oriental Mindoro (the province where I grew up) is surrounded by water, and boat is the only means of transportation to and from adjacent provinces like Batangas, which is where my father's hometown is. Though a boat trip going to Batangas takes 4 hrs. back when I was a little girl...I always looked forward to it...not just because I was excited to see my cousins but also because I loved all the kakanin (Filipino sweet delicacies) that were available in the pasalubong (homecoming gift) stores by the port. Espasol was one of them. 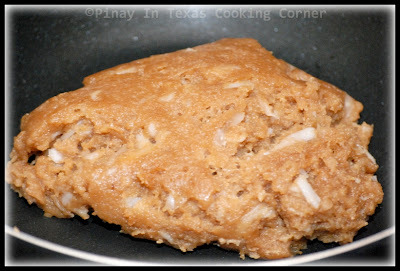 Espasol is a favorite kakanin of many Filipinos in South Luzon. 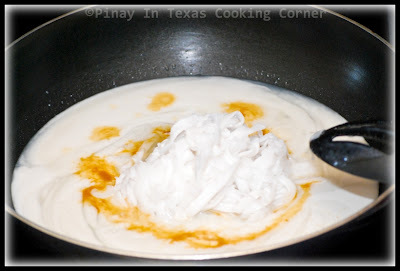 It is a cylindrical rice delicacy originating from the province of Laguna, and is made from ground toasted glutinous rice cooked with coconut strips in coconut milk and then dusted with toasted rice flour. You can find espasol in bus stops and in pasalubong stores in Batangas, Laguna and Quezon. Though I only got to go to Batangas 4-5 times a year when I was growing up, my father had to report twice a month to his Batangas office, and he always brought espasol as pasalubong for me. It has a very simple taste that I really like. 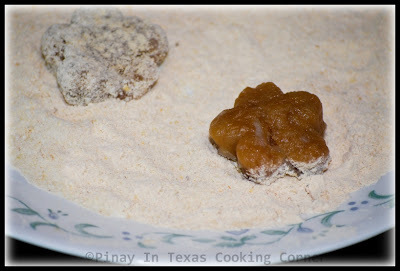 I like it so much that it is actually one of the first Filipino delicacies that I learned to cook. Today, I want to share with you my version of espasol. 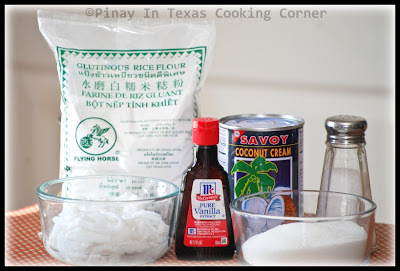 I usually used ground toasted glutinous rice but this time, I tried using glutinous rice flour instead. It's good...but I must say that freshly ground toasted glutinous rice makes tastier espasol. I also made them in different shapes instead of the usual cylindrical shape. Clarise and Cherlin found it more appealing! 3. Add the shredded young coconut, salt, and vanilla extract and bring to a gentle boil. 4. 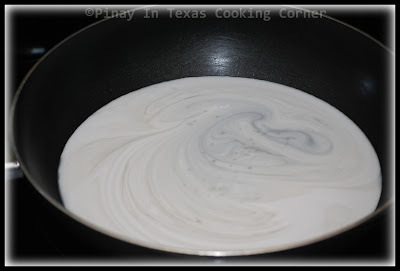 Gradually add 2 cups toasted glutinous rice flour or ground toasted glutinous rice while stirring. Cook over low heat, stirring constantly, for 30 minutes or until you get a soft dough-like consistency. 6. 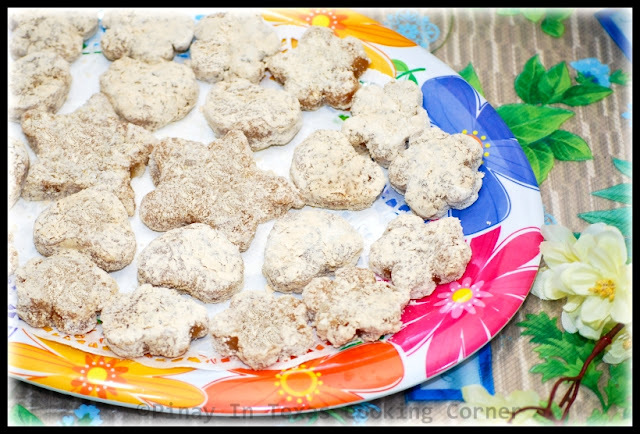 You can divide it into balls and roll each ball into a mini log like a tootsie roll and dredged it in the remaining toasted flour, or if you want it to be more fun and appetizing for the kids, cut it with different shapes using cookie cutters like what I did. 7. Arrange on a serving dish. Cover with plastic wrap until ready to serve. Looks good. Easy and tasty! Wow, I never heard of this Tina, sounds so interesting..Thanks for sharing this incredibly flavorful dessert! Love the shapes too! they look delicious, and have my favourite ingredient: coconut! Oh, we used to have fun eating this treat when we were kids and our mouth full of powder, LOL! 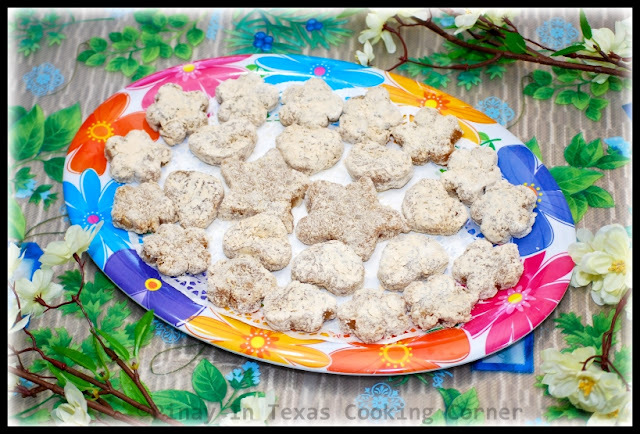 Thank you for sharing this recipe that is full of memories, Tina! Lovely outcome Tina although I am alien to this but bet the different shapes will spark up any kids and will be for their birthdays and celebration. I love your childhood story behind this sweet delicacy. 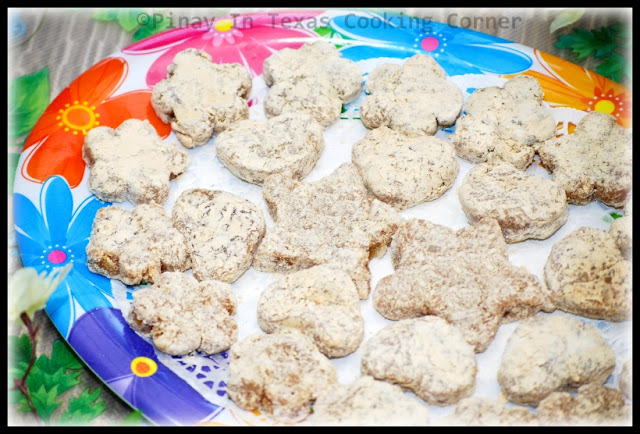 How wonderful that you are now making them for your children who will also have fond memories of these delicacies. They look adorable and I can picture little fingers reaching out for them and flour dusted smiles - I bet they didn't last long! Oh I dont think Ive ever tried that before! Looks great I love learning about new foods. Tina..I've never heard of espasol....but love anything with coconut! These look great! I love coconut... Thanks for sharing this recipe for espasol! Love rice desserts! They look so tempting and delectable. I've never heard of espasol...but I love all the ingredients, so know they must be delicious!!! pwede po ba macapuno gamitin ko? ?